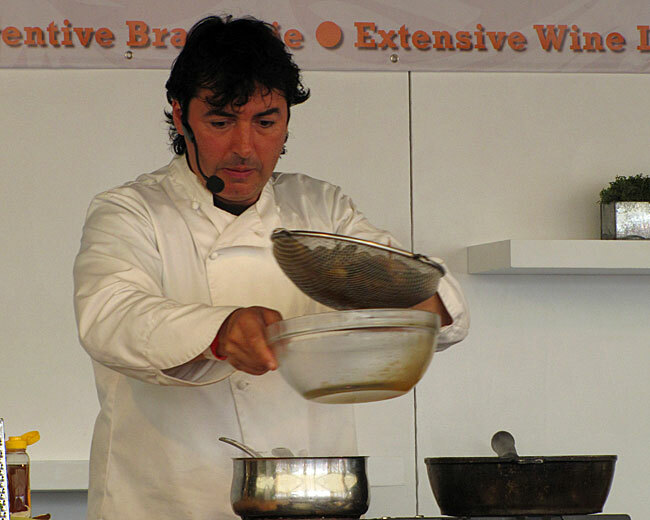 The main chef once again this year was Jean Christophe Novelli who has really taken Whitehaven festival to his heart and not only comes back each year but actively promotes it. In a typically French way he is passionate about everything but especially food. His ethos is that to be great, food has to be fresh and to be fresh it has to be local. 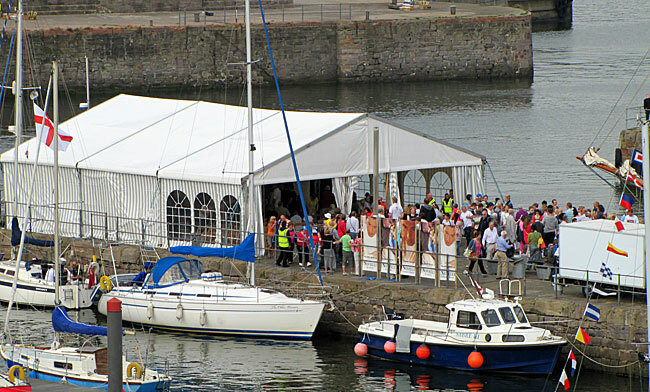 This year a large marquee was placed at the end of the Sugar Tongue pier so the chefs had a good back-stage area and could do their demonstrations without the wind blowing the ingredients away or rain getting in the electrics. This also allowed for an area of seating under cover but all these chairs were quickly taken so you had to get there early. 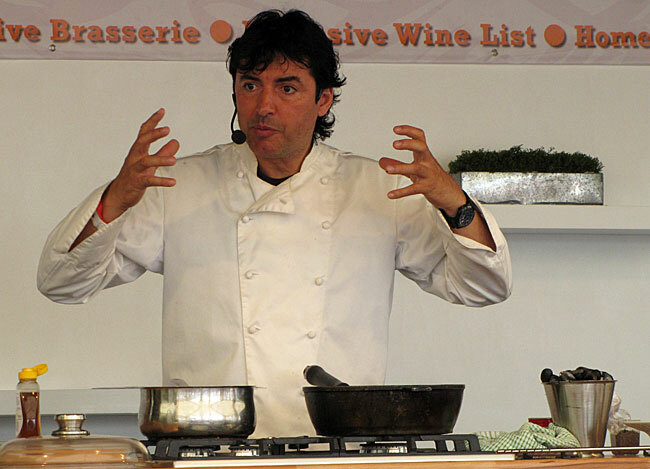 Last year Jean Christophe Novelli and festival organiser Gerard Richardson wrote a book to promote the festival called A Mad Frog and an Englishman in which local produce was used in recipes by Novelli and accompanying wines suggested by Gerard. 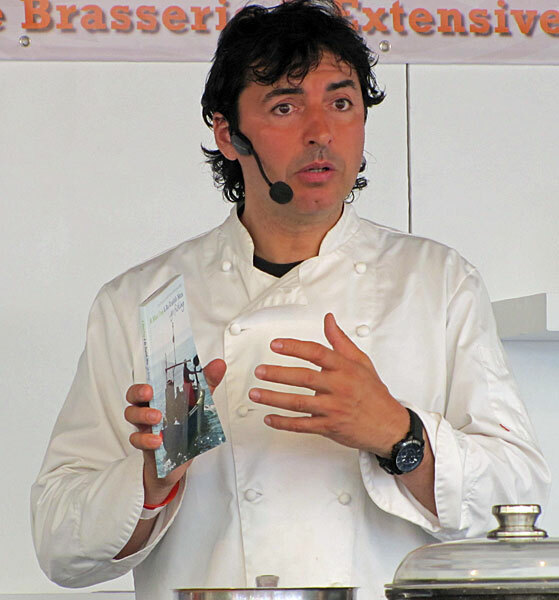 This year they decided to look at seafood landed locally with a second book which Jean Christophe Novelli was promoting entitled A Mad Frog and an Englishman ...go fishing. Once the book promo was out of the way he got straight into some cookery with a recipe from the book - a dish featuring mussels which he cooked quickly after first preparing the sauce. 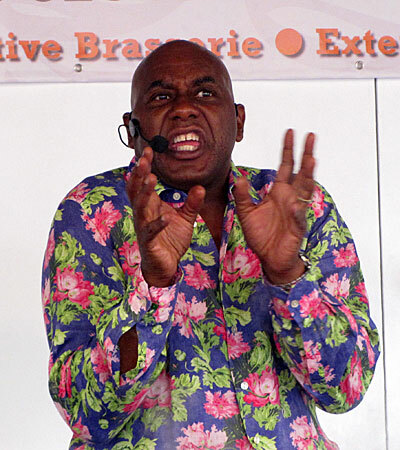 Ainsley Harriott is as enthusiastic as Jean Christophe is passionate. He never seems to switch off his bubbly over the top personality that made him famous on TV cookery show Ready, Steady, Cook which he presented for 10 years. 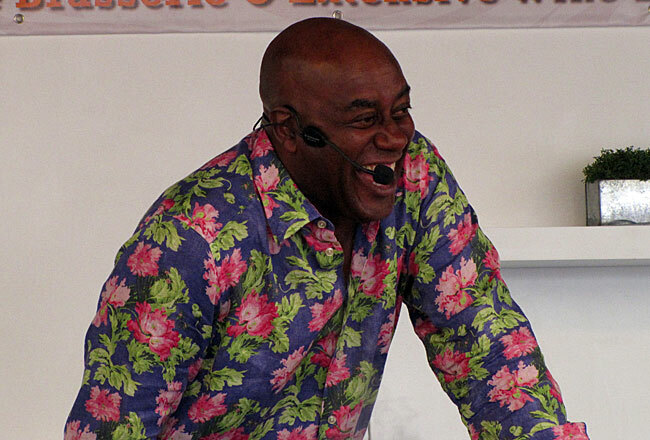 In addition to presenting 100's of TV shows, Ainsley Harriott has written a dozen books specializing in quick and easy recipes and was on hand to do book signings. 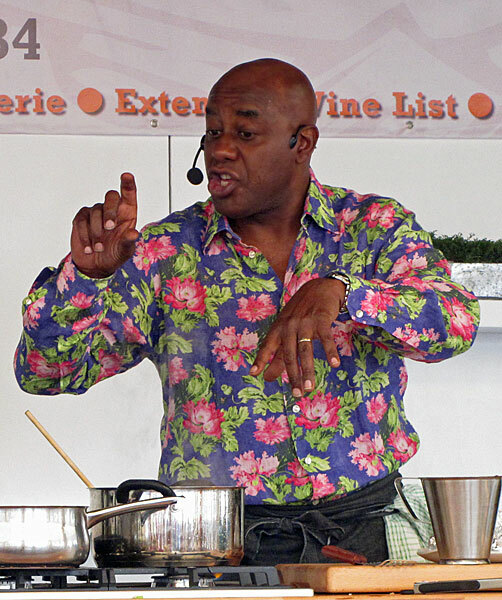 All the time he is cooking, Ainsley is talking. In fact, as his recipes are quick, he probably does more talking than cooking. 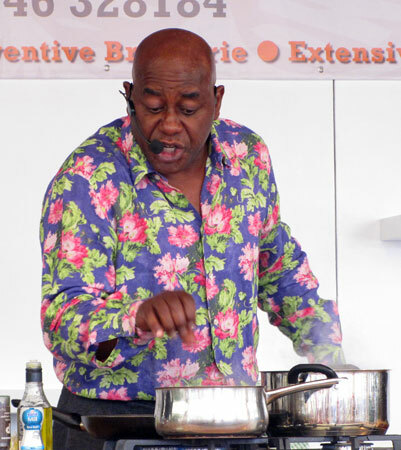 He's not just explaining the recipe but talking about his life with numerous anecdotes and constantly interacting with the audience, with a charming ease, as if they were all round his house just having a laugh. 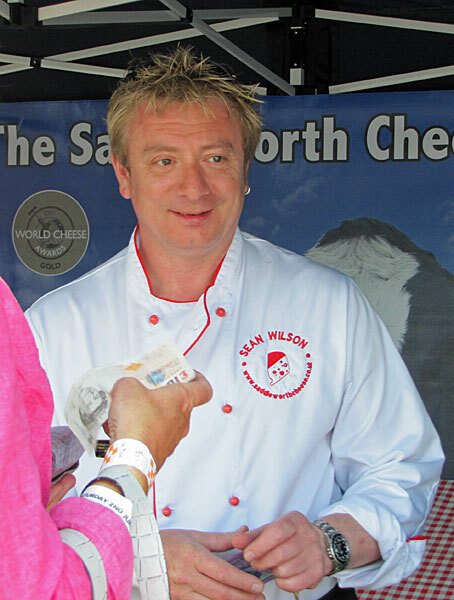 Back at the festival for the third year running was artisan cheese maker Sean Wilson who of course in his former profession as an actor played Martin Platt on Coronation Street. 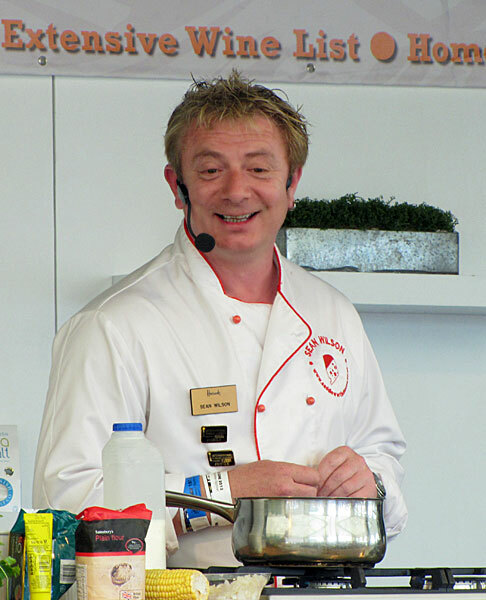 This year in addition to selling his own selection of cheeses from the Saddleworth Creamery he got up on stage to do some demonstrations. 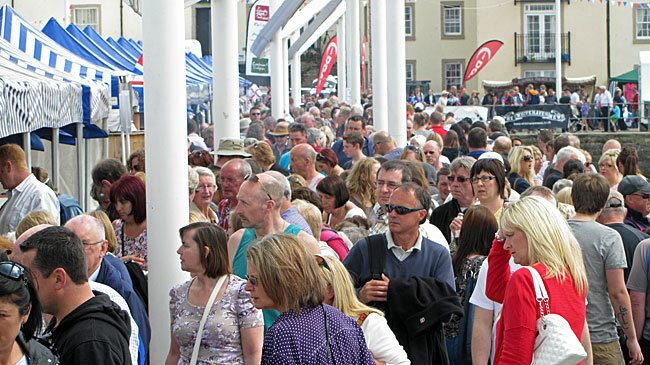 The Made in Cumbria village of tents spread along the Lime Tongue and as well as jewellery and other crafts of course featured much local specialist food produce and so the crowds filled the pier all weekend. 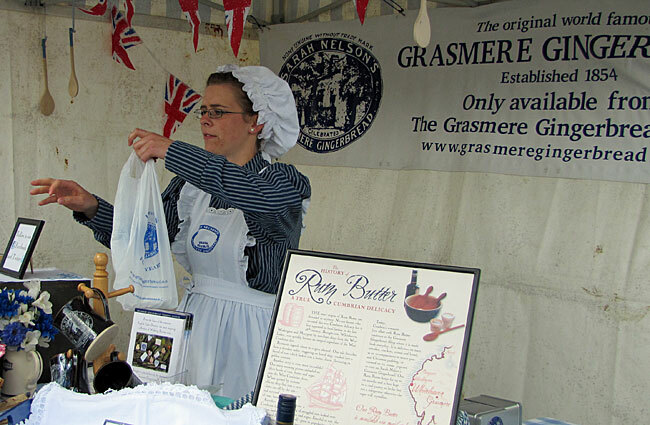 Of course, one of the most famous lakeland products is Sarah Nelson's Grasmere Gingerbread - still made by a family business from Sarah's original secret recipe that is locked away in a bank vault and served by a young woman in Victorian costume. As well as their unique gingerbread they also do their own rum butter and a selection of fudges. 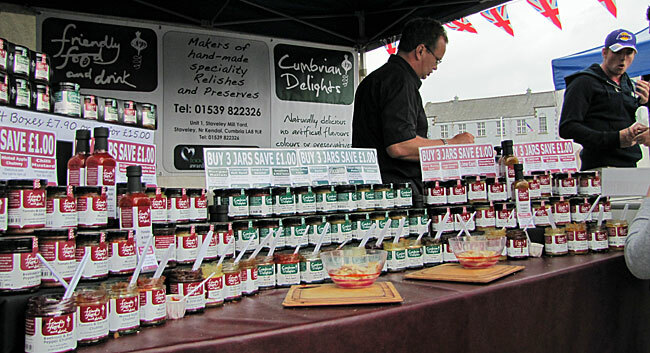 From Staveley near Windermere was a company that make the Cumbrian Delights range of preserves, chutneys and sauces. They also make the Friendly Food and Drink range of products that are free from glucose, nuts, dairy and gluten but full of natural goodness. 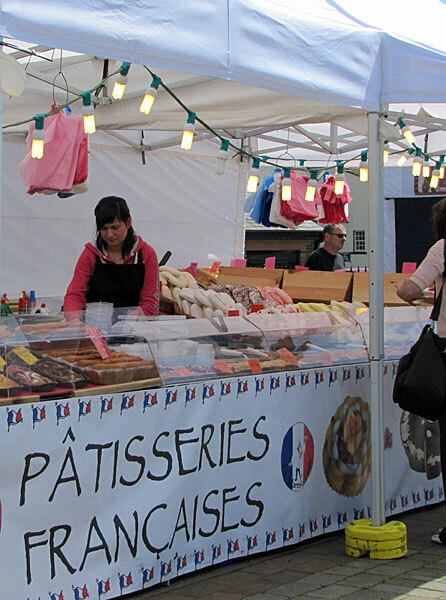 As well as the local produce there was also a great selection of hot and cold foods on the continental market which regularly visits Whitehaven and was also part of the festival.